I am an old fan of this program. Recently I upgraded the PC to Windows 7, so I had to re-install the programs including flowheater. 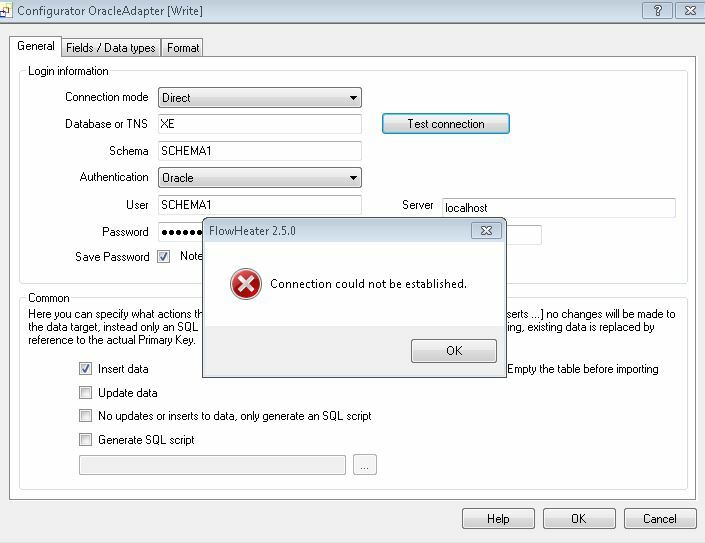 Everything worked fine on Windows xp, but now on winwos 7, I am not able to configure the Oracle Adapter, it seems the the adapter is not able to connect to the DB (on the same PC where flowheater is installed). Is there any additional sw or driver that I have to install? Any ideas? I did some test with the old version 2.5.0 and Windows 10. I created a new definition with the Oracle Adapter on the READ side. Wenn I dry to connect to the Oracle database I revceive the same error as you. Afterwards I saved this definiton with Version 2.5.0 and opened with verson 4.1.0 and the definition works fine. This behavior is related to the used third party Oracle connector library and OS Version > Windows Vista. The bad news, I connot provide a solution for this, I´m afraid you have to update to the latest version. The good news, it´s posible to update directly the latest version! I guess that if I go for update of flowhater, then I'll need to buy a new license. Am I correct?